It shows why the company could challenge Google and Amazon. The company took a playful approach to the form—but it has functional reasons for the design, too. On Thursday, Baidu debuted its entrants to the popular virtual assistant space: a connected speaker and two robots. Baidu aims for the speaker to compete against options such as Amazon’s Echo line, Google Home, and Apple HomePod. Inside, the $256 device will utilize Baidu’s DuerOS conversational artificial intelligence platform, which is already used in more than 100 different smart home brands’ products. DuerOS will let you use your voice to do things like ask the speaker for information, play music, or hail a cab. Called the Raven H, the speaker includes high-end audio components from Tymphany and a unique design jointly created by acquired startup Raven Tech and Swedish consumer electronics company Teenage Engineering. If its features seem familiar, the Raven H’s looks certainly do not. For the most part, the smart speakers we see today are cylindrical and either covered in neutral colored fabric or speaker grille-dotted plastic. They look like a speaker—or maybe an overlarge pill. Baidu’s Raven H takes a completely different, far more whimsical approach. 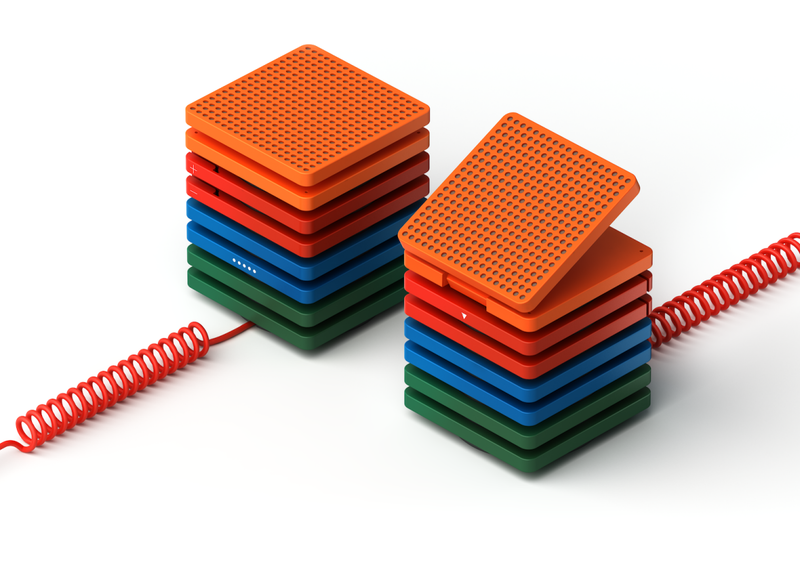 The device doesn’t look like a speaker at all—it looks more like a toy, with thin, colored square blocks stacked on top of one another into a small tower. The top block lifts and folds upwards to reveal a detachable touchscreen LED controller that you can use to operate it and other Raven devices. Even the power cord is fun—a springy red coil reminiscent of old telephone cables. The design is drawing attention: TechCrunch called it “the strangest smart speaker” and Quartz said the device stands out from the smart speaker crowd “for one reason.” While it goes on sale in December, Baidu already has a deal to outfit the device in 100 InterContinental Beijing hotels rooms. But that’s just the speaker. Baidu also introduced two robots, the Raven R and Raven Q (the latter of which is still in development). The Raven R looks like a cross between Pixar’s Luxo Jr. logo and a contemporary art sculpture. It’s a six-jointed robot that moves based on user commands in order to improve the interactive experience and make the device seem like it’s expressing emotions. The Raven Q will incorporate other emerging technologies such as computer vision and simultaneous location and mapping (SLAM) into a more advanced robot. And then there’s Baidu’s autonomous driving efforts. Baidu is working on powering driverless buses in China by 2018 and selling fully autonomous vehicles by 2021. The company already has more than 50 partners on board for its autonomous driving technology and is racing Alphabet’s Waymo (and other driverless vehicle makers) to be among the first to market. At this point, it’s unclear how much commercial success Baidu will have in the U.S. In an interview with Wired, COO Qi Lu explained that Baidu’s smart voice assistant technology is different from Siri, Alexa, or Microsoft’s Cortana in that it’s designed for smaller, less spacious homes that you’re more likely to see in Japan, India, or Brazil than in North America. But, like Amazon and its assistant Alexa, Baidu has a clear view of how its AI technology should be approached, and what is needed for it to succeed in the real world. Being AI-first is key. With the design of its Raven H speaker, which hides its touch-sensitive display, it’s clear Baidu has kept this in mind with its one of its first commercial products. And with its extensive smarts and delightful take on product design, Baidu could end up a winner among artificial intelligence companies.